The American Humanist Association (AHA) filed suit on behalf of Shari Webber-Dunn, who follows Thelema, a mystic philosophy developed by occultist Aleister Crowley that is based on the mantra “Do what thou wilt shall be the whole of the law.” Thelemites identify as anything from atheists to polytheists. According to the lawsuit, Christian prayers and messages are posted on bulletin boards throughout the Topeka Correctional Facility, with one board including an envelope where inmates may submit their prayer requests. “Don’t worry: God is never blind to your tears, never deaf to your prayers, and never silent to your pain. He sees, He hears, and He will deliver,” one of the messages reads. “In happy moments, praise God. In difficult moments, seek God. In quiet moments, trust God. In every moment, thank God,” another exhorts. Christian films are also broadcasted on facility televisions, and Christian music is played in the background while inmates participate in a crochet program for charity. A large cross is additionally displayed in a basement room used for various gatherings, including Christian worship services. “Webber-Dunn views the cross as disrespectful to all non-Christians and as echoing the oppressive message that Christianity looms over the inmates at all times and they are powerless to do anything about it,” the suit reads. In June, Webber-Dunn submitted a request that the Christian messages be removed from the bulletin boards and that the cross be covered when not in use for worship services. “Defendants’ actions, failures to act, and policies described above lack a secular purpose, have the effect of promoting, favoring, and endorsing religion—particularly Christianity—over non-religion, and result in an excessive entanglement between government and religion, thus violating the Establishment Clause,” the legal challenge reads. 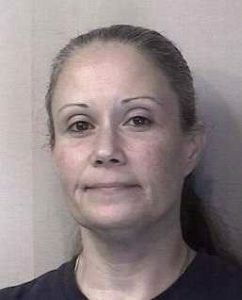 As Webber-Dunn claims that she has been “damaged” by her encounters with Christian messages at Topeka Correctional Facility, she is seeking an injunction prohibiting the prison system from displaying such messages and symbols throughout the all-women’s prison and “imposing strong Christian values on inmates” throughout the state. She is not eligible for parole until 2034.